Collaboration with State Bicycle Co. 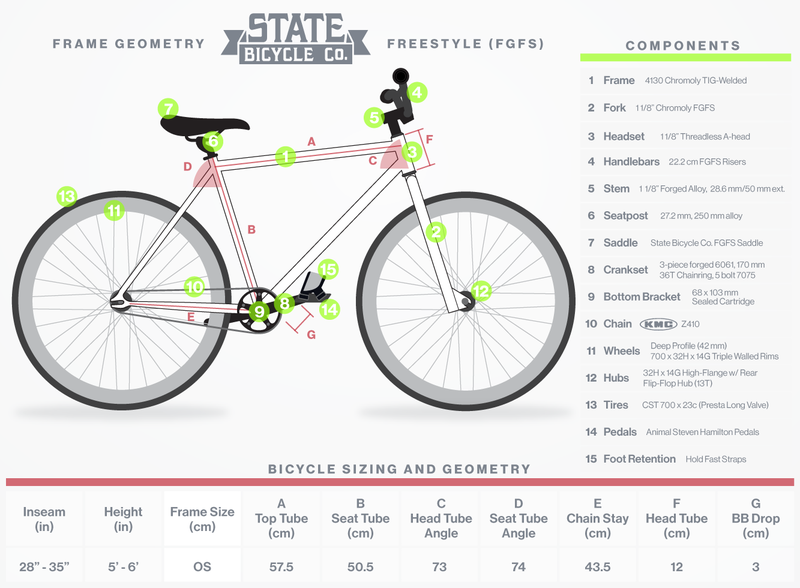 The 100% proprietary Fixed Gear Free Style (FGFS) geometry can accommodate complete 360° bar-spins & up to 50c tires. This light-weight FGFS model comes standard with a 36x13 gear ratio, allowing for a dynamic experience whether you're performing basic tricks, free-styling, urban street adventures, racing, playing bike polo, commuting, or going for a long ride. Wheelset: Deep Profile (42 mm). 700x32H x 14G Triple Walled Rims. Stem: 1 1/8'' Forged Alloy, 28.6 mm/50 mm ext. Size: One Size Fits All. See geometry here.